This article originally appeared in the North Island Gazette May 22, 2014. Brooks Peninsula is located just South of Quatsino Sound, on the West Coast of Vancouver Island. Isolated and remote, the area is home to the Mquqwin/Brooks Peninsula Provincial Park. The park was originally established as a Recreational Area in 1986 and expanded to a Class A Provincial Park in 1995. In 2009, following a partnership agreement signed between BC and the Che:k’tles7et’h’ First Nation, the park was given its present name, which means “the Queen” in the Nuu-Chah-Nulth language. One of the distinguishing features of this park is the fact that parts of its upland area (between seven and nine square kilometres) are believed by scientists to have been a ‘glacial refugium’ during the last ice age. From 35,000 to 18,000 years ago, all of the land in B.C. (with the exception of Haida Gwaii) was covered by the Cordilleran ice sheet that extended offshore and was up to 2 km thick. A number of factors led scientists to theorize that parts of Brooks Peninsula had protruded from the glacial mass (a group of mountains from 580m to 670m in height), and subsequent analysis of the geology and biology of the upland areas has supported this theory. This rocky outcropping would have been one of the only pieces of land exposed in the transition between the Pacific Ocean and a massive sheet of glacial ice. As the ice receded about 16,000 years ago and plant life returned, First Nations moved into the area. The first documented evidence of First Nations occupation of the North Island area is about 12,000 years ago. Since the time of contact with Europeans, Brooks Peninsula has been the dividing line between the Kwakwaka’wakw and Nuu-Chah-Nulth language groups, although in prehistory this area is believed to have had more fluid borders. Archeological examination of the area revealed one village site and a number of general use and burial sites. Growth of trees over house depressions suggest that the village was used up until the 1700s. It is estimated to have been home to about 3,000 people, in seven family groupings (nuyums). Explorer Captain James Cook called the area “Cape of Storms,” when he visited in 1778 in his ships the Resolution and Discovery. Cape Cook, on the north-west point of the peninsula, is named for this explorer. Captain of the Princess of Wales, in 1787. Solander Island, located off of the peninsula, is named for Daniel Solander. A contemporary of Cook, Solander was a noted biologist. The island is an Ecological Reserve, off limits to the public, home to a valued seabird nesting area. In 1788 Captain Duncan anchored in Klaskish Inlet, and called this inlet Brooks in subsequent correspondence. 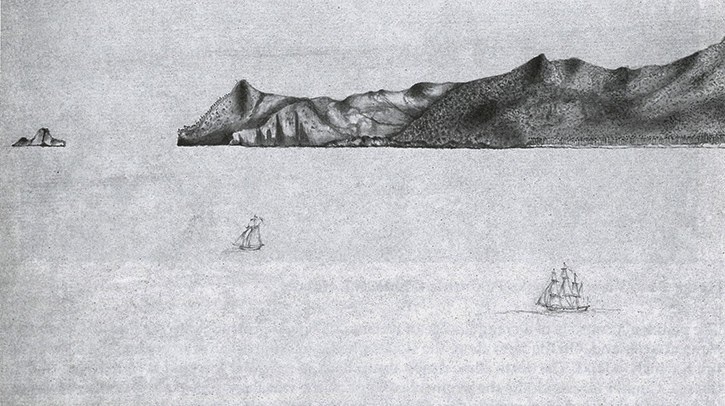 In 1795 Spanish officers Galiano and Valdes, who were surveying the area, named the inlet “Puerto de Bruks,” a Spanish interpretation of Duncan’s name. Captain Richards, surveying in 1862 on the Hecate, again confirmed this name. In the early 1900s the Ilstads built a cabin on the North side of the peninsula, from which they ran a trap line. In the 1970s a couple from Quatsino lived in a driftwood shack for an undetermined period of time, possibly two years.